Little Walter was too bright a star not to shine on the Chess recordings. 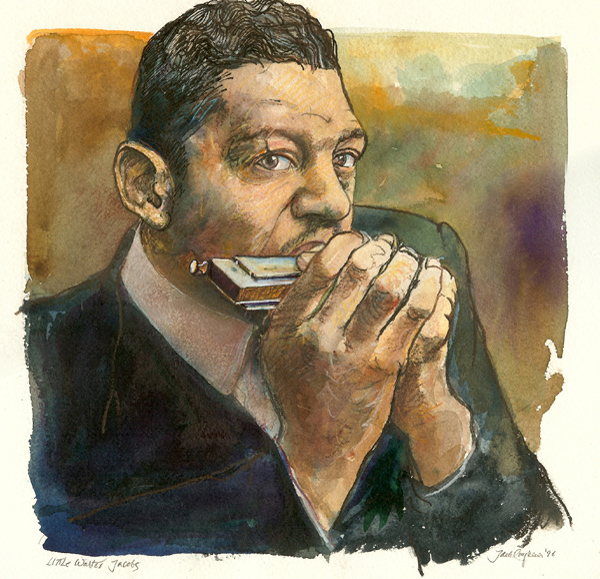 He played harp in new and innovative ways that play as prominent a role in Muddy Water’s records as Muddy’s vocals and guitar. By training himself to play singular notes on the harmonica, in bright and innovative patterns, his style matched that of bop jazz legends like Dizzy Gillespie and Charlie “Bird” Parker. His melodic style is at once smooth and fluid as well as angular and unpredictable. Walter always kept his lines fresh and very melodic, unlike the bombastic playing style of his predecessors. He was uniquely pioneering in two more aspects of harmonica as well. He began using the chromatic harp to jump scales and methods (most of which is beyond my musical knowledge). No one had ever played so aptly on a chromatic harp. Walter is also known for introducing distortion into his playing style. This idea was right on the cutting edge and he purposefully added distortion to his microphone to bolster the gritty blues sound. For these innovations, as well as his music, Little Walter has a fixed place in music history. The problem with Little Walter was simple: he was, in a word, brash. A friend of Walter’s, Luther Tucker, once said that he “loved to smoke grass, drink whiskey, chance [sic: supposedly “chase”] women, fight. . . . And he beat women, too. If a woman give him some lip, he’d fatten it up for her. And they’d just love it . . . it was amazing; they liked what he was doing” (Inaba 103) His personality in real life was not exactly as marketable as Muddy Water’s ‘mysterious bad black man’ persona, which attracted customers to his music. Dixon wanted Walter to attract people, not have them report the misanthropic harmonica player for black eyes and fat lips! So, Dixon started to create a persona for him, someone who could match Muddy Waters in charm but younger, slicker and a little less rough around the edges. He needed a clean look, and Dixon made him out to be “an ideal boyfriend who is truthful to his girl- friend: a ‘one-woman guy’ or ‘nice guy'” through some of his song choices and ideas (Inaba 103). And as the best might say, the rest is history. A relatively short one, admittedly, as Little Walter died in 1968. He came into the lime-light bright as a shooting star, and ended as abruptly. – Inaba, Mitsutoshi. Willie Dixon: Preacher of the Blues. Lanham, MD: Scarecrow Press, May 2011. eBook. Let’s start at the end of the story: in 1950, the Macomba Lounge burned to the ground, taking nobody but the building proper with it. In a single night, the Chess Brothers realized that they were given an opportunity in disguise. With their business acumen in the recording industry and their stake in Aristocrat Records, they took the insurance money that came from what was settled in their lounge and started Chess Records. The rest, as they say, is history. To anyone as business savvy as Leonard Chess, the Macomba Lounge was one of a three-pronged business strategy that the brothers Chess operated before the club burned down: “Leonard operated three discrete entities between 1942 and 1950, none of them simultaneously: Cut-Rate Liquor, 708 Liquor Store, and then the Macomba Lounge” (Cohodas 280-281). Situated right in one of Chicago’s burgeoning African-American neighbourhoods, the Chess brothers started to learn about the music and culture that would help in their dealings in the music industry in the coming years. More than that, it also became a place where they could test out the talents of the young musicians that would darken their doorsteps. “Everybody was out every night having a good time. It was a world of pimps, hookers, maids, chauffeurs, good-time whites, factory workers, white collar workers, musicians, entertainers, bartenders, waiters— everybody hanging out together… when a little money went a long way and there was no tomorrow” (Cohodas 399-401). It was in this type of environment did the Lounge thrive, as Leo Chess made sure that people came for the liquor, stayed for the entertainment, but came back for the musicians who constantly took over the bandstand. The likes of Tom Archia, tenor saxophonist, would be enough to attract other talent to come and play for the lounge proper. Some of the more well-known talents came over and stayed a while, like Ella Fitzgerald or Max Roach, but no one Phil or Leo ever hired. Rather, they began to have a feel for the African-American community by master their vernacular and noting their musical tastes. It’s arguable that the time they spent with the people in the community, be it the middle-class black folk looking for a good time or the junkies looking for another dealer, gave them a second sense of what type of music would sell and what wouldn’t: “The crowds in the Macomba and the popularity of Tom Archia and some of the other musicians were certainly an indication that a market for their music existed,” but it was knowing how to tap into that market that gave Chess records an edge (Cohodas 634-635). From the ashes of the Macomba Lounge, Chess Records rose like a Phoenix. Combining their knowledge bases from their time in Aristocrat Records and in the Macomba Lounge (and more than a little capital from both), the Chess Brothers became a force to be reckoned with in the music industry. – Cohodas, Nadine. Spinning Blues Into Gold: The Chess Brothers and the Legendary Chess Records. NYC, NY: Iconoclassic Books. May 2012. Kindle Edition eBook. As mentioned in my previous post, Willie Dixon liked to cater his songwriting to the demographic that he is writing for. One way in which he did that was by including references to folk beliefs in his songs. There was a certain appeal of black folk beliefs that people with down-home Southern roots could relate to. Furthermore, Dixon believed that those who sang the blues were preachers, as well as musicians, therefore elements of the supernatural were extremely likely to play into the lyrics of WIllie’s songs. Willie Dixon would include topics such as numerology, voodoo, and religion in the lyrics of his songs. In “Hoochie Coochie Man” he references the number seven continuously. “On the seventh hour, on the seventh day, on the seventh month the seven doctors say,” croons Muddy Waters on this Dixon composed tune. This number is significant in Christian theology due the seven days in a week, or the seven days of creationism, and the seven deadly sins. The song “Ain’t Superstitious”, performed by Howlin’ Wolf, spends the entire duration of the song listing different superstitions, such as “black cat just cross my trail”. Willie Dixon was the primary songwriter for Chess Records in the 1950s. He wrote for all of Chess’ big stars, including Muddy Waters, Howlin’ Wolf, and Little Walter. When choosing a song for a performer to record or perform he did one of two things. Willie Dixon would either choose a song for the artist out of his large stock of prewritten songs, or he would write a song on the spot for a particular artist. Both of these methods of picking the perfect song took a lot of consideration on the part of Willie. Many factors went into choosing what song would be appropriate for which artist. One important element when choosing the song, or writing the song, was the appearance of the performer, or the persona which they put on while giving a show. Something as seemingly trivial as a hairstyle or a signature dance move could lead WIllie to compose something different for an artist in order to fit their image. Another thing that WIllie took into account while writing songs was an artist’s commercial history. If an artist had had a big hit, then it is likely that Willie’s next song for them would be similar in style to that of their hit. Willie also took into account the demographic that was primarily buying the music. The age, gender and race of an artist’s fans was included in the thought process of writing a new song, so that the tune was sure to appeal to them. Because of the wide variety of artists that Willie had to write for, he became proficient in writing in many different styles of music. He was able to use regular forms and to modify forms. He was able to write Tin Pan Alley, Jump blues, and Doo Wop. He was also able to write both blues and pop songs. This versatility lead Dixon to the top of the music industry, leading him to write some of the most influential songs of the century. Where did Muddy Waters come from? That, though it seems simple enough, is a difficult question to answer. Everything about his early days is unclear, from his lineage to the very day of his birth. Things that seem like simple, basic facts to those of us living in today’s world, were parts of Muddy Waters identity that he never knew or that he changed so frequently that it was difficult to know if when was lying and when he was telling the truth. Muddy Water’s mother went by “Berta”, and though it was probably a nickname, it is unknown what her full name was. She was born sometime between 1893 and 1901, but the exact year is unknown. She was in her teens when she became pregnant with Muddy, but it is hard to know exactly when. At this time in the South there were no birth certificates issued when a baby was born, instead the family recorded the information of the date of birth and the name of the baby in the family Bible. Because of this, it is difficult to find the exact birthdays of most people in Muddy Waters’ life. There is also nothing documenting Berta’s death, but we do know that she died at a fairly young age. Muddy was raised by his Grandmother, Della Grant. The identity of Muddy’s father, as it often was in those days, is unknown, even to this day. Muddy Waters’ also had inconsistent records concerning his age, however he used this to his advantage by changing the year of his birth just as he pleased. Most sources give his date of birth to be April 4, 1913. This date was the one submitted on his Social Security card application from the 1940s. However, on his gravestone the date reads 1915. This may have been an attempt by Muddy to appear younger than he was in order to more effectively cut into the music industry. Muddy Waters gravestone, complete with the (probably) incorrect birth year is seen above. His given name was “McKinley Morganfield”, however he was named Muddy Waters by his grandmother due to the mischief in the mud that he would get into as a little kid. By the time Willie Dixon started making music for Chess Records, he been a part of just about as much of American culture as was possible. Raised in the Mississippi, he obviously had southern culture in his blood, however, he also had a great love for New Orleans culture and music in particular. His time in Chicago was the spent understanding city life and getting accustomed to life in the great migration. Willie Dixon developed his own set of spiritual tools through the music of the blues. In his life, he met innumerable hardships that any black southerner would have faced in the south in the first half of the twentieth century. Through the blues, Willie Dixon not only spoke about his own hardships and pains, but also provided help and sympathy to millions of others. At the age of 13, Willie’s father died though they had never lived in the same house. Willie’s mother worked to support her children and lost 7 of the 14 children that she birthed. Despite these hardships, Willie’s mother encouraged him to read poetry and engage in performance art. During this time, Willie was exposed to the harsh racism of the south and even suffered attacks from members of the Ku Klux Klan. Muddy Waters is attributed with having said, “Leonard Chess didn’t know nothing about no blues.” Whether or not he actually did, the statement is not far off. Leonard Chess did not even know much about music in general. What he did know was how to turn a profit and he had a great knack for opportunity. After meeting Evelyn Aron, who founded Aristocrat Records with Charles Aron, Leonard was convinced that he needed to get into the recording business. With a history in bending rules, Leonard took his brother and his expertise in selling liquor and owning a nightclub and eventually turned it into one of the most influential recording companies in the history. Undoubtedly, the success of Chess records is largely the result of his writers and performers, however, Leonard and Phil cannot be discredited for their savvy business sense and eagerness to leap on a new opportunity. In 1941 and 1942, Alan Lomax recorded Muddy Waters under the name Morganfield McKinley. After recording with Lomax, Muddy Waters received a check and a copy of the recordings. Though he had already lived in and left Chicago, Muddy took his solidified proof of musicianship as a sign that he belonged back in the city. So in 1943, Muddy Waters returned to Chicago. In Chicago, his sound developed more dramatically in production than in style of play. Once signed signed to Aristocrat, which became Chess Records, Muddy Waters developed the definite blues lineup and sound. We now call this style Chicago Blues. One of the earliest examples of Chicago Blues is the song “Rollin’ Stone,” which provides great insight for the cultural combination that Muddy Waters encompassed. “Rollin’ Stone” is also known as “Catfish Blues” because it derives from an eponymous southern folk song by the same name. Early recordings of “Catfish Blues” offer an acoustically-based song that stays on the I chords throughout the verse and moves to the IV and V during the instrumentals breaks. Muddy Waters approaches the song entirely the same way, except he plays it with an electric guitar. “Rollin’ Stone” is an example of a very bare bones Chicago Blues song. The style is generally hallmarked with a lineup of electric guitar, harmonica, piano, bass and drums. The harmonica, vocals and electric guitar usually receive the most prominent spots in this rhythmic, riff-based genre. With songs like “Hoochie Coochie Man” and “I Can’t Be Satisfied,” Muddy Waters burst on to the national scene with the help of Little Walter, the rest of his band and Willie Dixon at the helm, writing the songs. Once you’ve heard the Chicago blues, it truly stays with you forever.